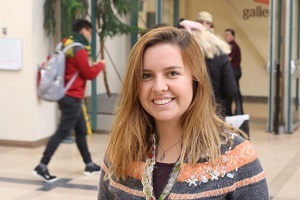 This Fall the University of Winnipeg Students Association elected a new Graduate Students Director: Laura Cameron from the MA in Indigenous Governance Program. We connected with her to find out about her plans for the upcoming year. Can you tell us about your academic program and your area of research? I am currently in my second year (third semester) of the Masters of Indigenous Governance program, working in the Indigenous Studies and Geography departments. My research relates to Indigenous communities' perspectives on and responses to climate change in the prairies. I am working with the Turtle Lodge in Sagkeeng First Nation, as well as other communities across Alberta and Saskatchewan. My interests are broadly in how Indigenous knowledge and worldviews may inform solutions to the environmental and climate challenges facing global society, while prioritizing Indigenous communities in those solutions. I am also interested in exploring how participatory documentary video can be used in this context, and am working with Dr. Ian Mauro and his team of researchers and filmmakers. Prior to coming to UW, I received a BSc in Biology from McGill, which was what sparked by interest in climate change and sustainability. What kinds of student issues are you interested in addressing as Graduate Student Director? As is reflected in my research interests, I am passionate about environmental and social justice issues. On campus, I hope to be involved in improving sustainability measures and raising awareness of environmental issues on campus and beyond. I am currently part of the planning committee for Grass Routes Sustainability Festival, which will take place on campus in January 2018. I also plan to support organizing against the provincial government’s recent tuition hikes and budget cuts to social programs that affect students. I recognize that graduate students have different experiences at UW and may face different challenges than the rest of the student body. I look forward to hearing about the issues that other students are passionate about and advocating on their behalf within the UWSA. Have you been involved in governance (student or otherwise) in the past? I have several years of experience working with environmental and climate justice organizations in the community, including as part of steering committees and sitting on boards. Through these experiences I have aimed to democratize decision-making and reduce hierarchical governance as much as possible, which I hope to continue to do this year. So I hope to hear from students about their concerns so that we can work together on how to address them. How can students contact you? What made you choose The University of Winnipeg for graduate studies? I was drawn to UW because of the work of one of my advisors, Dr. Ian Mauro, in combining participatory research, documentary video, and interactive communication tools to bridge the gap between science and public perceptions and understandings on climate change.